If yogurt is a part of your families diet, the milk should start raw, then be LOW HEAT pastuerized (raw milk yogurt is illegal in CA), and contain no added sugar. Since yogurt contains sugar naturally (lactose), you may want to get the plain flavor and add your own berries and nuts. Yogurt is also a great place to “hide” healthy macro greens and reds for your kids. 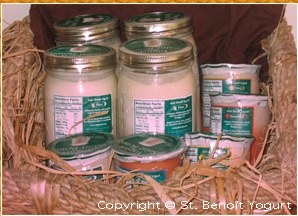 This Sonoma, CA company, St. Benoit yogurt does a great job. Our Yogurt is made solely from Jersey cow’s whole milk and is cultured with L.bulgaricus and S.thermophilus, the yogurt making bacteria. We use wholesome pasture-fed organic cow’s milk from John Mattos’ family farm in Two Rock (near Petaluma) in Sonoma county. Our Yogurt culture comes from France where it has been used for decades to produce sweet, mild and smooth yogurts. Unlike most producers, we add no thickeners, stabilizers or preservatives. Just milk and culture, that’s it! Yogurt is probably most popular in Europe, Eastern Europe, The Middle East and Western Asia. Yogurt came to the United states via immigrants and its popularity is relatively recent. Yogurt is an excellent source of protein, calcium, riboflavin and vitamin B12. It contains more calcium and protein than milk because of the added culture. Typically a cup of yogurt has 450 mg of calcium, compared to 300 in a cup of milk. This is 30 percent to 50 percent of most people’s daily needs. Because live yogurt cultures break down the lactose, yogurt is a healthy way to get calcium for people who do not tolerate milk products. Yogurt also benefits the digestive tract. Live yogurt cultures encourage the right kind of bacteria to multiply. These bacteria help digest food and prevent a variety of infections. Recently it has been used for replenishing bacterial flora in the digestive tract after extensive antibiotic therapies that can deplete the body of both good and bad bacteria. There is no raw yogurt allowed under California law, and all milk must be heated on the way to becoming yogurt in order to make the healthy bacteria grow. However, we begin with fresh raw milk and then low heat pasteurize it on the way to becoming yogurt, rather than high heat pasteurizing and then reheating the milk to make the yogurt. We do not homogenize. Our yogurt is safe for small children and pregnant women. The smooth and creamy texture in our yogurt is obtained form just two ingredients: milk and culture. Our milk is cultured after pasterurization, meaning that the yogurt you are eating is full of live, active cultures, ready to provide you with continual health benefits.